These students were present at the reception when the summer arts scholarships were presented. Front Row, from left: Mason Bassett, Riley Schultz, Alicia Barhite, Mia Wenger and Cassie Kosier. Second Row: Lauren Garrett, Karli Callanan, Paige Moden, Matthew Wachtman, Taylor Troutman, Deanna Herr and Jonathon Poe. Not pictured were Ivan and Katelynn Moor, Anna and Elijah Thomas, Isabel Roth, Gus Stuckey, Sean Baker, Hunter Eash, Samantha Keil, Daisy Price, Serena Riling and Emma Kwiatkowski. 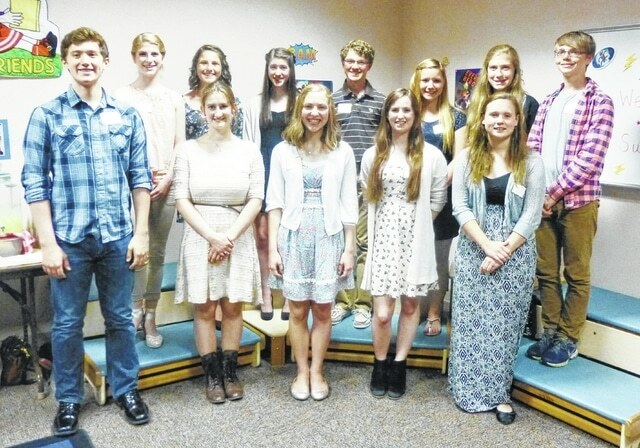 ARCHBOLD – The Black Swamp Arts Council recently recognized the recipients of their Summer Arts Scholarships for 2015. On June 8, at a reception at the Archbold Community Library, 24 students from 11 different schools, were awarded a total of $4,500 in scholarship money to attend summer camps or workshops related to the arts. This year’s recipients will attend camps and programs at sites including Joffrey Summer Dance Lab, Pennsylvania Ballet Summer Intensive, Cleveland Institute of Art, BGSU Summer Music Institutes (which includes Brass Camp, Strings Camp, and Double Reed Camp); Harmony Camp at Ohio Wesleyan University, Ohio Ambassador of Music to Europe, West Coast Nationals Elite Dancer Program, Ohio Scottish Arts Camp at Oberlin College, HFCC Performing Arts Camp, Wooster College Music Camp, and Private voice, piano and strings lessons. “Once again, we were so impressed by the talent in this group of students and their passion for their art area. They are going to be participating in some very enriching, highly-regarded and exciting programs this summer and will return to their schools and communities as leaders in their bands, choirs, dance and art departments,” said Diane Tinsman, BSAC Board President. These local students are listed with the grade level that they are enrolled in for the 2015-16 academic year. Hunter Eash, Swanton High School, junior, Wooster Music Camp. Deanna Herr, Swanton High School, junior, Wooster Music Camp. Samantha Keil, Swanton High School, junior, Wooster Music Camp. Cassie Kosier, Swanton High School, junior, Wooster Music Camp. Jonathon Poe, Swanton High School, sophomore, Wooster Music Camp. Daisy Price, Swanton High School,, sophomore, Wooster Music Camp. Serena Riling, Swanton High School, sophomore, Wooster Music Camp. Isabel Roth, home schooled from Whitehouse, seventh grade, Huron Forest Camp CedarRidge Performing Arts Company. Taylor Troutman, Swanton High School, freshman, Wooster Music Camp.